I love it all!!!!! Thanks for sharing. love the kitchen and the marble! gorgeous - and the table - to die for!!!! I am in love with your kitchen! Amazing. And love the finish on the table! Great looking kitchen Who made the cabinets? Thanks so much for all the nice comments. The cabinetry is by Crown Point - can't recommend them more highly! Wow! What a great job! just love the table! I love those stools too. They're antique, from a vineyard. I bought them at an antique store in San Anselmo, CA called San Anselmo Country Store. 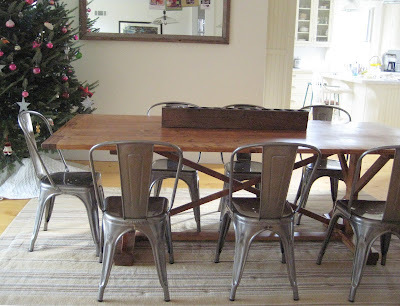 Wonderful old pine furniture - these were just random pieces that I loved! You caught the pup in mid-yawn! Great post. What a wonderful home , I am crazy for your kitchen . Absolutely beautiful! You've done a fabulous job! I adore Concord! So very charming! Really fond of the two little antique stores down from the kitchen store in the charming center! I've enjoyed reading through your blog! Being from New Haven, I like the black railroad sign you have! Was that from an antique store?